Answer: I'm sorry, no we do not have a plan as you have described. Question: our local codes states that a detatched garage can not be more than 14' 6"" at the mid point of the truss .The info on your plan says the ridge is 14'-1.5" this doesn't seem quite right if the garage door is at least 13' for an rv. can you confirm this please. 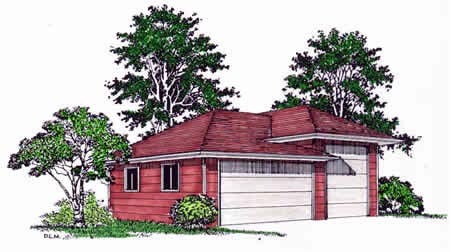 Answer: The Garage door is a 9’-0”X10’-0” overhead door, the plate height is 11’-0” and the roof pitch is 4/12 so with the grade at 6” below the top of foundation the ridge height is 14’-5 ½” including the 5/8” roof sheathing. Answer: The over head door sizes are: 16'-0"x7'-0" and 9'-0"x10'-0"